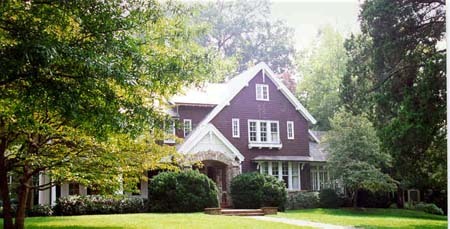 The Lambeth-Gossett house, emoted in 1916 in Charlotte’s posh suburb of Myers Park, has been associated with two distinguished Charlotte families. The first residents were Charles Lambeth, a real estate and insurance man who was later elected Mayor of the city, and his wife Laura Cannon Lambeth, who was a daughter of Cannon Mills founder James William Cannon. In 1921 the Lambeths sold the rambling Bungalow style dwelling to Benjamin B. Gossett. Gossett was a regionally prominent textile leader who controlled a chain of mills stretching across several states, and he resided at Granville Road throughout much of his professional career, until his death in 1951. Charlotte and Myers Park in the 1910’s and 1920’s The first years of the twentieth century were perhaps Charlotte’s greatest boom period. Population doubled and redoubled as Charlotte become the banking and trading center of the vast new Piedmont textile manufacturing region. As early as 1906 over half the looms and spindles in the South were within a hundred mile radius of Charlotte, and by 1927 Charlotte was the hub for some 770 mills, which led the world in production of cotton thread and yarn.1 Between 1890 and 1930 Charlotte moved from being the Carolinas fifth-largest city, to a ranking as the number one urban center in North and South Carolina, the position it holds to this day.2 Beginning with trolley magnate E.D. Latta’s Dilworth in 1891, the fast-growing city sprouted a ring of streetcar suburbs.3 The grandest was Myers Park, a 1200 acre project begun in 1911 under the leadership of banker and real estate developer George Stephens.4 Stephens sent to Boston to hire one of the nation’s best young planners to lay out his suburb. Harvard-trained landscape architect John Nolen was then at the dawn of a career which would eventually number more than four hundred projects coast-to-coast.5 In his 1927 book New Towns for Old, Nolen devoted an entire chapter to Myers Park’s creation, calling it a neighborhood “Designed right from the first end influenced only by the best practice in modern town planning.”6 Nolen’s design for Myers Park introduced Charlotte to the concept of curving streets, shaped to follow natural topography. He created parks, moved in hundreds of trees to shade the avenues, and even provided landscape advice to early lot buyers. The attention to detail paid off, for Stephens quickly began selling lots to many of the city’s economic leaders, who formerly had clustered close to downtown. First to come were banking and real estate men, including Stephens himself. Next came the engineer-entrepreneurs of James Buchanan Duke’s Southern (now Duke) Power Company, pioneer supplier of hydroelectricity to the textile region. The third major group to arrive in Myers Park were the textile mill owners themselves not usually the mill tenders, who stayed in the small towns near their enterprises, but rather their sons and daughters. Laura Cannon Lambeth ( -1952) was daughter of James William Cannon (1852-1921 ), one of the most influential men in the rise of the Carolina textile industry. In 1887, he built his first mill in the Cabarrus County village of Concord. Prior to Cannon, most Piedmont mills had produced yarn or semi-finished “greige goods.” James Cannon was able to produce finished goods; his lines of bed linens and towels made Cannon a nationally-known brand name. By the 1910’s, he controlled a chain of enterprises, most of them centered in the company-owned town of Kannapolis, thirty miles northeast of Charlotte. Some of his ten sons and daughters made their homes near the family business, but several, including Martin L. Cannon and Laura Cannon Lambeth, took up residence in Charlotte’s Myers Park. Laura came to Charlotte to marry young Charles E. Lambeth (1894?- 1948). Lambeth was born in Fayetteville, NC, about 1894 and came to Charlotte after schooling at the University of North Carolina at Chapel Hill. In 1916 he was working for brother, Walter Lambeth, who ran the insurance department of Charlotte’s American Trust Company (predecessor to today’s mammoth NCNB, the South’s largest banking corporation).13 It was no surprise that Charles and Laura Lambeth looked to Myers Park for their first home. Developer George Stephens was also a founder and officer of American Trust and thus Lambeth’s boss! On December 6, 1921, Benjamin B. Gossett (1884-1951) purchased 923 Granville Road from the Lambeths.22 The Gossett family name is today less well-known then the Cannons, but the Gossett clan wielded considerable power in the Carolina textile economy of the first half of the twentieth century. Benjamin’s father, James Pleasant Gossett (1860-1939), was a successful merchant in Williamston, South Carolina, when he took over the presidency of the town’s ailing cotton mill in 1901. J.P. Gossett built the one mill into a chain of for factories, and became an important figure in a variety of trade associations, serving as President of the American Cotton Manufacturers Association in 1927.23 Benjamin B. Gossett entered the family textile business in 1907 after education at Clemson University and the U.S. Naval Academy.24 With his father and brother he worked to add more plants to the Gossett chain, and by the late 1910’s the funnily owned the Williamston, Brogan, Calhoun, Riverside and Toxaway mills in South Carolina. In 1921 the Gossetts purchased control of the Chadwick-Hoskins mill group in Charlotte. Organized in 1908 as one of the region’s pioneer chains, it included the city’s Chadwick, Hoskins, Alpha, and Louise mills, plus the Dover Mill in nearby Pineville. Benjamin Gossett became president of the new acquisition, and took up residence in Myers Park. B. B. Gossett lived at 923 Granville Road for the remainder of his long and busy career. He was president not only of the Chadwick-Hoskins group, but also of the Cohanett Mills in Fingerville, South Carolina, and the Martinsville Cotton Mill in Martinsville, Virginia. He continued to serve as vice president and/or treasurer of several of the family’s South Carolina mills, including the Williamston, Toxeway, and Brogon plants. In 1939, upon his father’s death, Benjamin B. Gossett took over leadership of the entire Gossett chain. He sold the enterprise in 1946 to Textron, Inc., for an estimated $13 million dollars. During the 1920’s, 1930’s, and 1940’s, as he helped guide the growing Gossett holdings from his downtown offices in Charlotte’s Johnston Building, Benjamin B. Gossett also undertook a broad range of related professional activities. He served on the boards of directors of several other textile concerns, plus a number of banks, railroads, and insurance companies, among them the Seaboard Railway, the Piedmont & Northern Railway, the Central Railroad of Georgia, Liberty Mutual Insurance Company, and the Turner, Halsey company of New York. B.B. Gossett followed in his father’s footsteps as an active member of regional and national trade associations. On September 19, 1961, Catharine Gossett sold her long-time residence to Charles W. Tull and his wife Phyllis.30 Mr. Tull operated the Tull Development company, which built and leased small office buildings throughout Charlotte. The couple had four children, and made good use of the big house. In September of 1967, the Tulls moved to a newer section of southeast Charlotte. C. Carl Warren, Jr., physician at nearby Presbyterian Hospital, bought the dwelling.31 He and wife Josephine lived there for almost twenty years. In December of 1986 the Warren family sold to W. Barnes Haupfuhrer and his wife. Barnes Hauptfuhrer is an investment banker with Kidder-Peabody. Wife Camilla Robinson Hauptfuhrer is a grandniece of Benjamin B. Gossett.32 They are having the house remodeled as residence for themselves and their young child. 1. Name and location of the property: The property known as the Lambeth-Gossett House is located at 923 Granville Road, Charlotte, North Carolina. 5. Current Deed Book Reference to the property: The most recent deed to this property is recorded in Mecklenburg County Deed Book 5396, page 564. The Tax Parcel Number of the property is 155-051-08. 6. A brief historical sketch of the property: This report contains a brief historical sketch of the property prepared by Thomas W. Hanchett. a. Special significance in terms of its history, architecture, and/or cultural importance: The Commission judges that the property known as the Lambeth-Gossett House does possess special significance in terms of Charlotte-Mecklenburg. The Commission bases its judgment on the following considerations: 1) the Lambeth-Gossett House, erected in 1916, is one of Charlotte’s finest examples of Bungalow-influenced architecture; 2) the Lambeth-Gossett House is one of the older homes in the most imposing section of Myers Park, Charlotte’s elegant streetcar suburb that was developed by the Stephens Company and designed by John Nolen and Earle Sumner Draper; 3) owners of the Lambeth-Gossett House, most especially Charles E. Lambeth, Laura Cannon Lambeth, and Benjamin B. Gossett, have played prominent roles in the civic and business life of Charlotte and its environs. b. Integrity of design, setting, workmanship materials, feeling, and/or association: The Commission contends that the architectural description included in this report demonstrates that the property known as the Lambeth-Gossett House meets this criterion. 9. Ad Valorem Tax Appraisal: The Commission is aware that designation would allow the owner to apply for an automatic deferral of 50% of the Ad Valorem taxes on all or any portion of the property which becomes “historic property. The current appraised value of the improvement is $309,200. The current appraised value of the .545 acres of land is $90,000. The total appraised value of the property is $399,200. The property is zoned R12. 1 Thomas W. Hanchett, “Charlotte Suburban Development in the Textile and Trade Center of the Carolinas, in Catherine Bishir and Lawrence Earley, eds., Early Twentieth Century Suburbs in North Carolina (Raleigh, North Carolina: North Carolina Division of Archives and History, l 985), p.70. Thomas W. Hanchett, “Charlotte and Its Neighborhoods The Growth of a New South City,1850-1930,- 1986,” chapter 1 (unpublished manuscript in the files of the Charlotte Mecklenburg Historic Properties Commission). 2 United States Bureau of the Census, Sixteenth Census: 1940, volume 1, pp.772, 976. These pages conveniently recap population figures for major Carolina cities, beginning with 1790. 3 For a map of Charlotte’s streetcar suburbs see Hanchett, “Charlotte. Suburban Development,”. p.71. For background on the streetcar suburb phenomenon read Sam Bass Werner, Jr., Streetcar Suburbs: The Process of Suburban Growth in Boston.1870- 1900 (Cambridge, Massachusetts Harvard University and the M.I.T. Press, 1962). 4 For additional background on Myers Park, see Mary Norton Kratt and Thomas W. Hanchett, Legacy: The Myers Park Story ( Charlotte: The Myers Park Foundation, 1986). 5 John L. Hancock, “John Nolen and the American City Planning Movement: A History of Cultural Change and Community Response,1900-1940 (Ph.D. dissertation, University of Pennsylvania, 1964), pp.1 -20. See also John L. Hancock, John Nolen: Bibliographical Record of Achievement (Ithaca, New York: Cornell University, Program in Urban and Regional Studies, 1976). 6 John Nolen, New Towns For Old: Achievements in Civic Improvement for Some American Small Towns and Neighborhoods ( Boston: Marshall Jones, 1927), p. 1 00. A copy of this book is in the collection of the Carolina Room of the Public Library of Charlotte and Mecklenburg County. 7 Hugh Talmage Lefler and Albert Ray Newsome, North Carolina: The History of a Southern State, 3rd edition (Chapel Hill, North Carolina University of North Carolina Press, 1973), p. 156. 8 Mecklenburg County Register of Deeds Office: map book 230, p.128; deed book 289, p. 606; deed book 302, p.592; deed book 349, p.456. 9 Charlotte Mecklenburg Utility Department: water permit 6596. 10 Mecklenburg County Register of Deeds Office: deed book 358, p.612. 11 W.M. McLaurine, James William Cannon (1852-1921): His Plants, His People, His Philosophy ( New York: The Newcomen Society in North Carolina, 1951). For Laura’s obituary, see the Concord Tribune July 1,1952. She and Lambeth divorced in 1933, and both later remarried. 12 Charlotte Observer, September 13, 1948. Lambeth’s passing was important enough to warrant an article at the top of page one of the newspaper. 13 City directory collection in the Carolina Room of the Public Library of Charlotte and Mecklenburg County. 14 Unattributed newspaper clipping dated June 25,1918, in Lambeth’s vertical file in the Carolina Room of the Public Library of Charlotte and Mecklenburg County. See also Charlotte Observer, September 13,1948. 15 Dan L. Morrill, “White Oaks, the J.B. Duke Mansion: Survey and Research Report, unpublished report prepared for the Charlotte Mecklenburg Historic Properties Commission, 1977. 16 Phyllis Tull, past owner, telephone interview with Thomas W. Hanchett, March 27, 1987. Camilla Hauptfuher, present owner and grandniece of past owner B.B. Gossett, interview with Thomas W. Hanchett, February 20, 1987. Camilla Hauptfuhrer heard the story from previous owner Carl Warren. 18 Hanchett and Kratt, Legacy: the Myers Park Story, pp.182-84. 19 LeGette Blythe and Charles Brockmann, Hornets’ Nest: The Story of Charlotte and Mecklenburg County (Charlotte: McNally of Charlotte, l961), pp.450, 452. Charlotte Observer, September 13, 1948. 20 Charlotte Observer, September 13,1948. 22 Mecklenburg County Register of Deeds Office: deed book 454, page 176. 23 Marjorie W. Young, ed. Textile Leaders of the South (Columbia, South Carolina: R.L. Bryon Company, 1963), pp.76-77,751. 24 Unless otherwise noted, biographical information on B.C. Gossett in this historical sketch is down from: ibid. ; Charlotte Observer, November 14, 1951; and Who’s Who in the South and Southwest, volume I (Chicago: Larkin, Roosevelt & Larkin, Ltd., 1947), p.564. 25 Charlotte Observer, November 14,1951. Gossett was such on important figure that his obituary and a large photo were featured now the top of the front page of the paper. 27 S. Frank Jones, telephone interview with Thomas W. Hanchett, March 30,1987. 28 Charlotte Observer, November 14,1951. 29 For death certificates see the Mecklenburg County Bond of Health vital statistics files for November 13,1951 (#1482) and January 25,1965 (#177). For Mrs.Gossett’s obituary see the Charlotte Observer, January 26, 1965. 30 Mecklenburg County Register of Deeds Office: deed book 223g, p. 194. Phyllis Tull, telephone interview with Thomas W. Hanchett, March 27, 1987. 31 Mecklenburg County Register of Deeds Office. deed book 2893, p.584. Warren added a sliver of land along one side of the lot in 1975. See deed book 3796, p.916. 32 Mecklenburg County Register of Deeds Office: Wed book 5396, p.564. Camille Hauptfuhrer, telephone interview with Thomas W. Hanchett, March 30,1986. The outside of the Lambeth-Gossett house has the woodsy look of a hunting lodge. This was characteristic of the Bungalow style inspired by the rustic trail-side shelters of British India, and brought to America at the end of the 1890’s.2 During the 1900’s and 1910’s many thousands of houses across the United States were decorated in “hand-hewn” chic — asymmetrical massing, exposed rafters in the eaves, wood shingles, prominent porches, chunky window and door woodwork, and hearty chimneys built up of rounded boulders. When Myers Park opened in 1911, this rough-and-ready style was adopted by many of the suburb’s wealthiest new residents. Its imagery was perfect for a neighborhood whose developers advertised, “Out of the dust, out of the heat — a country home on a city street.”3 In massing, the Lambeth-Gossett house is strongly asymmetrical. It consists of a two-story main block enlivened by numerous gabled bays and porches, and a pair of two-story rear wings. One wing, which held service spaces and a sleeping porch, juts off at a picturesque angle. The other wing, which holds the library and a bedroom, is said to have been added by the Gossett family when they bought the house in 1921.4 It extends straight back from the main block. The main block is a welter of slate-covered gable roofs. A large asymmetrical gable dominates the front facade. Its wide eaves are decorated with rafter-like brackets, and a carved pendant hangs down from the peak. On the south side of this main gable, there is a secondary gable, a tall chimney of angular stones, and also gabled sunporch. To the north of the main gable, there extends a roof ridge terminating in a jerkin-head side gable. A massive front chimney promises a cheery hearth within. Walls of the main block are finished in dark brown wood-shingles. Windows come in a variety of rectangular shapes and sizes, double-hung and hinged sashes. Most have small square or rectangular multiple panes. Here and there bracketed window hoods and flower boxes project. In front of the chimney runs the broad main porch, covering half of the first-story facade. It consists of a flat-roofed pergola-like section with scalloped rafter ends and massive Doric columns, and a smaller entry bay whose gabled roof is carried on stone arches. The rear of the house is finished in much the same manner as the facades visible from the street. All walls are wood-shingled. The 1921 library/bedroom wing is skill fully blended with the 1916 house. The wing has a slate-sheathed hip roof with exposed rafters in the eaves, and an exterior stone chimney at the rear. The wing’s second story windows are four-over-four-pane double-hung sash units, but the downstairs openings have hinged sash with tiny diamond-shaped panes, giving an Elizabethan architectural flavor. The service/sleeping porch wing also has a hip roof and a stone chimney. A shed-roofed one-story projection extends from the end of this wing. Between the two wings, a bit of the main block of the house is visible. Its second story features a bank of windows, decorated with flower boxes. The first story is a row of doors, opening from the grand hall inside onto a rear terrace. This terrace, with a Neoclassical balustrade of carved stone, is being rebuilt by the present owners The Lambeth-Gossett House, like most Myers Park houses, is sited on a fairly compact lot — slightly more than half an acre. Trees and shrubs are arranged naturalistically, in keeping with the dwelling’s rustic character. The driveway runs along the north side of the residence, from the street back to the detached garage. The garage is located at the back corner of the lot, but nonetheless almost touches the house. The architecture of the outbuilding echoes that of the main dwelling. It is one-and-a-half stories tall with a jerkin-head roof, and wood-shingle siding. Eave trim end window treatment are borrowed from the residence. Downstairs the garage has space for two cars. Above, reached by a delightfully winding rear stairway with tongue-and-groove walls, is a former servant’s quarter, now greatly remodeled. An interesting feature of the garage area is actually part of the adjoining John Bass Brown House. The Brown garage, a brick Colonial style structure, sits right next to the Lambeth-Gossett driveway. William Peeps, architect of the John Bass Brown House circa 1924, thoughtfully finished the back of the brick garage in wood-shingle siding, stained dark brown to match the Lambeth-Gossett decor. In the late 1920’s and 1930’s, the Bungalow style passed out of favor in America. Rediscovered “historical” styles became the vogue, propelled in part by the widely publicized restoration of Colonial Williamsburg. By the middle of the century in Myers Park, as elsewhere across the nation, stylish housewives who could afford the expense hired workmen to rip out robust Bungalow, Tudor and Craftsman style interior detailing and substitute the delicate molding and mantels of the Colonial Revival. Among the Myers Park houses known to have been treated in the manner are the E.C. Marshall House, 500 Hermitage Road, and the Earle Sumner Draper House, 1621 Queens Road. The Lambeth-Gossett house evidently met the same fate.5 There is no evidence that any walls were moved or eliminated, but most of the interior trim was apparently replaced, except for the handsomely panelled library, a number of doors, and possibly one bedroom mantel. Today most of the mantels and woodwork are in the Colonial style with elegant molding. The renovation was skillfully and tastefully done, leaving few clues for even the practiced eye. The strongest hint is in the dining room at the front of the first story. The exterior here has a prominent exterior stone chimney, but its promise of a fireplace inside is not kept. The dining room almost certainly did have a fireplace originally, but there is now no trace of it. Another strong hint is found in the south front bedroom, where a small window visible on the exterior is nowhere to be seen inside. A less obvious clue is embodied in the interior doors throughout the house. They are four-panel units which lack any decorative molding around the panels, an omission which characterizes the rough-hewn aesthetic of the Bungalow, and contrasts with the dainty Colonial Revival embellishment seen in nearby mantels and other trim. One enters the Lambeth-Gossett House through a massive Bungalow- style doorway framed with sidelights and a high arched transom. Immediately inside is a foyer/hallway with a heavy modillion cornice. To the right through an archway is the living room, and beyond it the sunporch and the library To the left through another archway is the dining room, and beyond it the kitchen and pantry areas. Straight ahead through a pair of massive pocket doors ( still operable) is the grand stairhall, with its French doors opening onto the rear terrace. The focus of the living room is an Adamesque mantel. It features fluted pilasters, Grecian dentils, carved swag, molding, and a carved oval center panel depicting a bowl of flowers. Inside the mantel is a fireplace surround of white marble with bold black figuring. Today owner Camilla Hauptfuhrer is removing virtually all of the surviving interior partitions, and plans to add a new exterior window. Two early windows remaining have interesting hardware — interior cranks operate exterior-louvered shutters. The grand stairwell is literally and figuratively the heart of the Lambeth-Gossett House. It is a delightful two-story open space which rivals the living room in floor area. At its first floor rear is the bank of glass doors opening onto the back yard. At its first floor right winds the wide stair, which now has slender turned balusters which may not be original. The stair rises to a balcony-like landing, and then to the second floor. Around three sides of the second floor level is a balcony, onto which all the upstairs rooms open. The result is a masterful piece of architectural design, which visually connects upstairs and downstairs, interior and garden, and which provides an elegant promenade for partygoers or casual guests. There are four bedrooms, three bathrooms, and a spacious sleeping porch upstairs. Throughout there are wide baseboards and simple cornices. The north front bedroom boasts an elegant mantel with slender paired columns, and a safe hidden behind wood paneling. The south front bedroom contains the “hidden window” apparently covered during mid-century remodeling. The rear bedroom above the library appears to retain its original 1921 mantel, ornamented with chunky pilasters rather than dainty columns. This room also has a big closet with a built-in chest of drawers and a light that goes on automatically when the door opens. Few of the original bathroom fixtures survive, though the south bathroom still has its high-tiled wainscoting and an extra-long tub. The north bathroom has been completely gutted by the Hauptfuhrer’s work crew, revealing a pencilled notation “J.H. Erwin, June 27, 1917” left on the wooden framing by an early workman. Next to the bathroom is the sleeping porch. These rooms were popular in the 1910’s, when sleeping with plenty of fresh air was though to be healthful especially in the prevention of tuberculosis. The Lambeth-Gossett sleeping porch resembles a moderate sized bedroom completely lined with windows. Opening off the second floor balcony is the stair to the attic. Inside the attic door is an ancient fuse box. At the top of the stair are several rooms with walls and ceilings sheathed in tongue-and-groove woodwork. The attic over the main block of the house is completely finished in this manner, though the spaces over the rear wings are left unfinished. One room has a skylight, which appears to be original. Another is a walk-in cedar closet, built to store out-of-season clothes and draperies. 1 It has not been possible to determine the house’s architect. 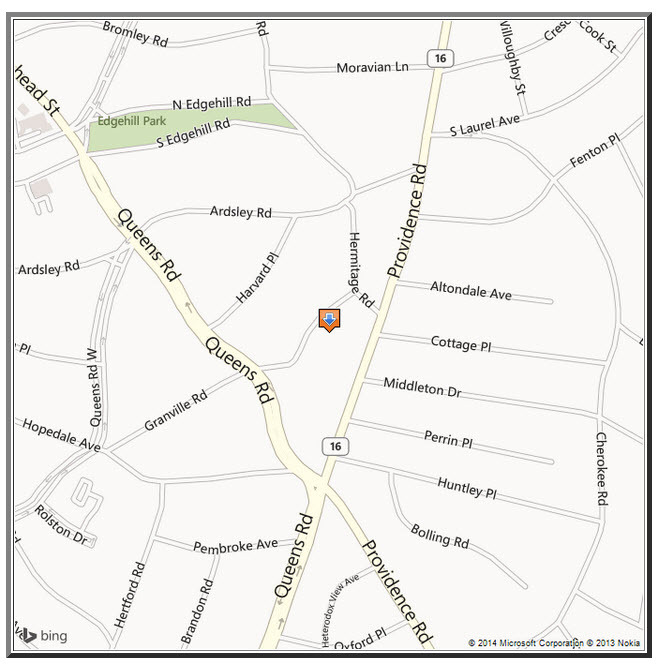 No pre-1954 building permits for 923 Granville Road survive in the files of the Charlotte Mecklenburg Building Standards Office. Extant permits date from 1954 (installation of a gas range), 1961 (remodeling of the kitchen and minor repairs to the rest of the house), 1970 (electrical upgrading), and 1975 (electrical upgrading). 2 Clay Lancaster, “The American Bungalow, in Dell Upton end John Michael Vlach, eds., Common Places. Readings in American Vernacular Architecture (Athens, Georgia University of Georgia Press, 1986). 3 Thomas W. Hanchett, “Charlotte: Suburban Development in the Textile and Trade Center of the Carolinas,” in Catherine Bishir and Lawrence Earley, ads, Early Twentieth Century Suburbs in North Carolina (Raleigh, North Carolina: North Carolina Division of Archives and History, 1985), p. 74. 4 S. Frank Jones, telephone interview with Thomas W. Hanchett, March 30, 1987. 5 The Draper and Marshall renovations were done in the 1940s and 1950s. However, Charlotteon S. Frank Jones, who married Gossett daughter Katherine in 1931, remembers no major renovations to 923 Granville Road during his long association with the family. It is possible that Laura Cannon Lambeth was responsible for the Colonial woodwork. She may have directed a redesign of the Bungalow’s interior while it was under construction in 1916. There is no question that she was a partisan of delicate Colonial architecture by 1927, for her Charles Barton Keen-designed residence at 435 Hermitage Road is strongly influenced by that style. 6 Building permits, and Phyllis Toll, telephone interview with Thomas W. Hanchett, March 27, 1987. Hanchett: Lambeth-Gossett House, April 2, 1987.